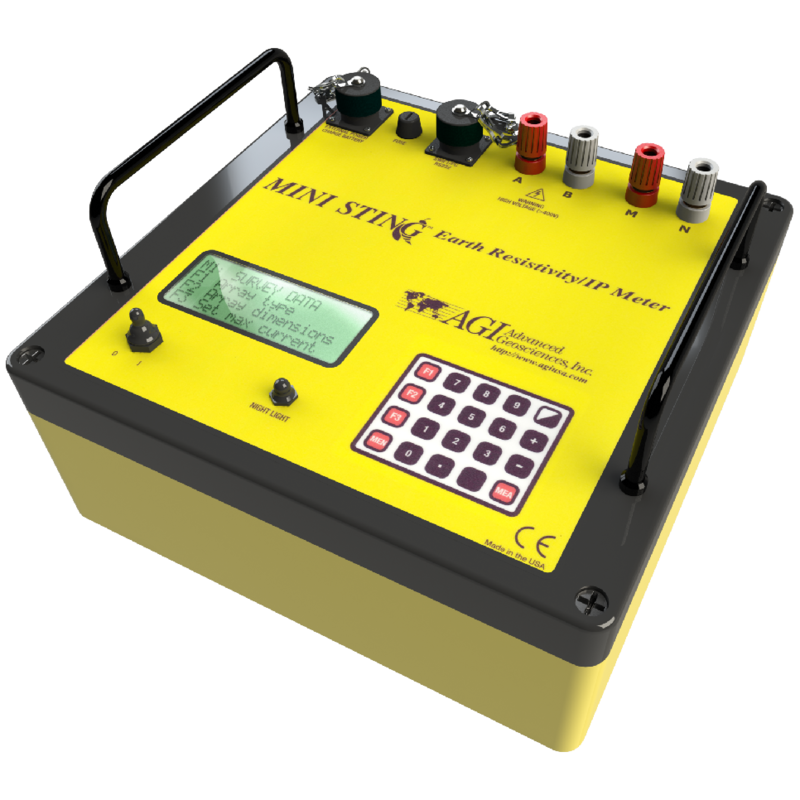 The MiniSting™ R1 is a high-powered, induced polarization (IP) and electrical resistivity instrument used for testing grounding grids, soil resistivity testing for corrosion protection design, and more. This single-channel tool is engineered to be the best tool for manual resistivity jobs—ease of use, low cost, and high accuracy make it ideal for low-manpower explorations and educational and training demonstrations. This high-powered, lightweight tool has a built-in rechargeable NiMH battery—you can get a day’s worth of manual surveying from one charge. The system includes a battery charger. An easy-to-use, menu-driven system. Recorded data is saved in the internal memory and at a convenient time downloaded to a computer for further processing. Our utility software, The Administrator, is included with the MiniSting™ as well as a serial download cable with a USB adapter. The Administrator software is used for data download. Rugged construction. Whether you’re working in the swamp or the desert, the MiniSting™ is versatile enough to withstand harsh climates and provide accurate data. The MiniSting™ reports in feet or meter: For example, the Wenner 4-pin method is typically specified for Wenner spacing in feet, but the reporting is required in Ohm Centimeter. Simply set the MiniSting™ for feet before surveying, and switch to meter after the survey before you download the data. Then move the decimal point two steps to the right to get Ohm Centimeter. This instrument can be configured in several ways depending on what you are measuring. Pairs seamlessly with AGI tools for immediate results. For example, you can get more from your data when you pair the MiniSting™ with the EarthImager 1D—in addition to empirical calculations, you’ll also get modeled calculations that represent true resistivity, layer thickness, and depth to each layer so you can use your results and immediately take next steps with certainty. Apparent resistivity, resistance, voltage (SP), induced polarization (IP), and battery voltage. 400 Kohms to 0.1 milliohms (resistance). 0-500 V full-scale voltage autoranging. The user can switch between high and low voltage limit for the transmitter (800 Vp-p or 320 Vp-p voltage limit). Actual electrode voltage depends on transmitted current and ground resistivity. Automatic. Always uses full dynamic range of receiver. 1, 2, 4, and 8 s.
Basic measure time is 1.2, 3.6, 7.2, or 14.4 s, as selected by user via keyboard. Autoranging and commutation adds about 1.4 s.
Continuous averaging after each complete cycle. Noise errors calculated and displayed as percentage of reading. Reading displayed as resistance (dV/I) and apparent resistivity (Ohmm). Resistivity is calculated using user-entered electrode distances. Better than 100 dB at f>20 Hz. Better than 120 dB at power line frequencies (16 2/3, 20, 50, and 60 Hz). Resistance, Schlumberger, Wenner, dipole-dipole, pole-dipole, pole-pole, azimuthal, mise-a-la-masse, SP (absolute), and SP (gradient). Full resolution reading average and error are stored along with user-entered coordinates and time of day for each measurement. Storage is effected automatically. More than 3,000 measuring points can be stored in internal memory. RS-232C channel included to dump data from instrument to PC on user command. USB adapter is included for data download to a USB port. 20-key-tactile, weather proof keyboard with numeric entry keys and function keys. Alphanumeric LCD display (four lines x 20 characters) with night-light. 4 banana plug, pole screws for current and potential electrodes. 10-pole KPT connector for external power, RS-232C and synchronization connections. 12V, 4.5 Ah NiMH built-in rechargeable battery. External power connector on front panel. The instrument automatically selects external battery if present. Depends on conditions. Internal circuitry in auto-mode adjusts current to save energy. At 20 mA output current and 10 kOhm electrode resistance, more than 2,000 cycles are available from a fully charged battery pack. Dual-stage charger with switchable input (115/230 V AC at 50-60 cycles).